Cash form of money may be required for a number of different activities in the day to day work environment. 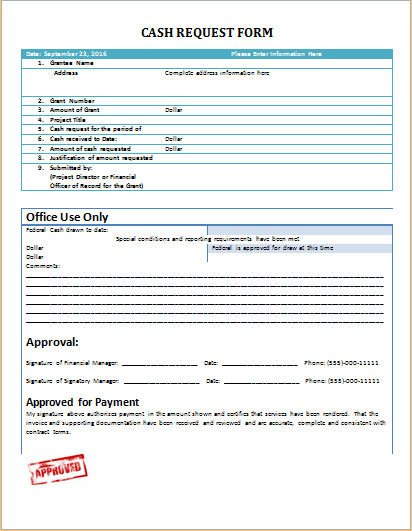 A cash request form is a pre-drafted text document that is used at various levels in an organization. It helps employees and managers to withdraw elements like petty cash from the accounts or finance department. The petty cash is the money that is utilized in an organization for small tasks or activities being carried in a routine on daily basis. Sometimes the cash request forms are used for withdrawal of advance payments and advance salaries as well. When this condition is applicable, the person or party submitting the cash request form may not only state the required amount of money but also the reasons or cause behind this request. Then there is another utilization of the cash request form as well. That is its usage in the purchasing or procurement departments of the company or organization. The purchaser will submit the cash request form to the concerned authorities for the release of funds for procurement of goods and services. The form will contain information about the goods and services being purchased along with the amount that is needed to make the purchase. Thus we see that a cash request form is a multi-purpose written document that can be utilized for the achievement of various goals and objectives related to cash disbursement in an organization. It provides the information about the cash with-drawer along with the reasons for cash withdrawal.